Regions for Sustainable Change is a partnership of 12 organizations from 8 European countries. Through regional cooperation, the project aims to promote a shift toward a greener economy and try to identify opportunities that take into account costs and effects of moving toward an economy less dependent on coal. The European regions have enormous potential to be the first to experience the shift toward a future less dominated by coal and contribute to sustainable growth. RSC's ambition is to invest in this potential and provide support to European areas to tackle climate change. The project started in October 2008 and is funded under the European program Interreg IVC. The main objective of this project is to develop the potential of the regions to encourage adaptation to climate change and promoting sustainable socio-economic development. RSC will help regions to achieve this goal by analyzing the current regional practices and providing innovative tools as well as a guide to tackle climate change at regional level. In addition, RSC will strengthen the capacity of regional authorities through the sharing of best practices and experiences on the risks of climate change and options for adaptation. 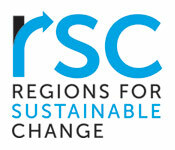 Regions for Sustainable Change (RSC) is made up of 12 organizations of the following countries: Austria, Bulgaria, Hungary, Italy, Poland, Malta, Spain and Great Britain. Through the network, and regional cooperation, RSC partnership will be a model for other regions across Europe, by promoting a shift towards climate friendly economies. Collaboration with the Piedmont Region for the promotion of environmental policies and sustainable climate awareness to the issue of climate change.